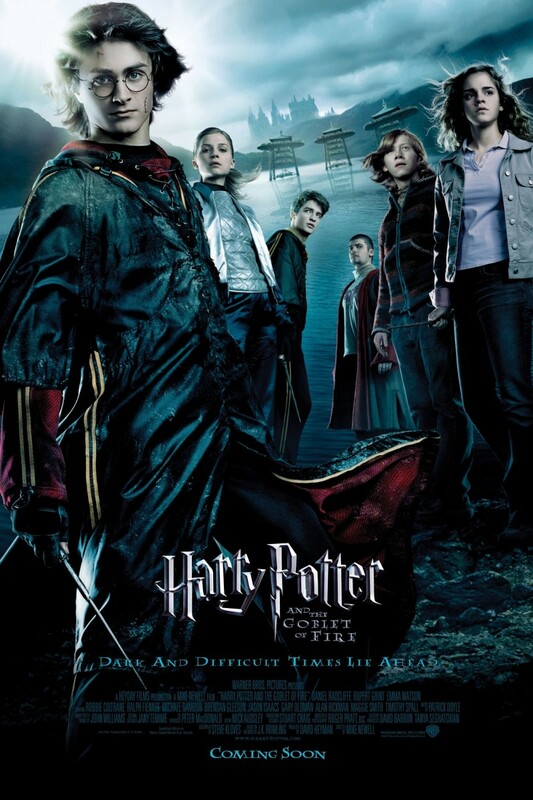 Movie: "Harry Potter and the Goblet of Fire"
Hogwarts is the host of this year's annual Triwizard tournament where three schools come together and compete for eternal glory. Meanwhile, the growing presence of Voldemort's followers, known as Death Eaters around the wizarding world, starts to create terror in an effort to revive their Dark Lord. "Harry Potter and the Goblet of Fire," aka the one where Daniel Radcliffe has distractingly long hair, is the fourth installment in the Harry Potter movie franchise. It is directed by Mike Newell, who takes the helm from previous director Alfonso Cuarón. Newell is known for such films as "Four Weddings and a Funeral" and "Donnie Brasco." This installment is written by Steve Kloves, still based on the book by J.K. Rowling. Of course, the whole cast returns, including the main three characters Harry, Hermione, and Ron, played by Daniel Radcliffe, Emma Watson, and Rupert Grint. With each new installment comes a few new characters and actors, and this one is no exception. Here, we have a brilliant addition with 'Mad-Eye' Moody, played by Brendan Gleeson, Cedric Diggory, played by Robert Pattinson, Barty Crouch Jr., played by David Tennant, and of course, Ralph Fiennes, who takes over the role of Lord Voldemort. Timothy Spall also gets his part as Peter 'Wormtail' Pettigrew expanded a bit. This installment continues down the darker path that began in "Harry Potter and the Prisoner of Azkaban." This is the first installment to get a PG-13 rating, offering continuing appeal to a maturing target audience. This sequel focuses on a competition known as the Triwizard tournament. It brings in wizards from other parts of the world beyond just the UK and Ireland, and shows the different look and approach each school has to magic, teaching, and wizardry. It also brings in fantastical new creatures like dragons and merpeople. As always, we get a look at Lord Voldemort, his growing powers, and his hold on his followers as the Dark Lord. Excluding Harry, some of kids at Hogwarts are also introduced to their first real experience with death in their world, none of which ever feels distasteful and fits into the film nicely. Just as the characters age, so to does the ultimate tale woven around them, be it happy or sad. There is a lot of fun and excitement in the tournament itself, which makes for a wonderful viewing experience full of ever-evolving CGI and cool new wizarding tricks. This installment also ends on an extremely dreary, depressing note, showing that the lighthearted whimsical world of Harry Potter isn't all pumpkin juice and chocolate frogs, but rather a very dangerous place full of dark magic where no one is safe. "Harry Potter and the Goblet of Fire" is a great follow up to the fantastic "Prisoner of Azkaban," but it's only going to get darker still.